"Huh," she says mildly, tilting her head to one side, studying her reflection. Swirls of white nestled in golden, sun-tipped fur. Black spots dappling too-long ears. Dark green eyes, narrowed slightly, half-hidden under light lashes. "Huh," she repeats, frowning once more at the Zafara in the mirror before turning away. There's a strange feeling in her chest. Must be time for a change. Good – she was getting tired of Island anyway. But the next day when she stares at herself again, stares into safe brown Pirate Korbat eyes, the feeling is still there. "Aww, aren't you a cutie pie!" She smiles, preens, pushes self-deprecating thoughts away and prances around on unsteady hooves for the audience. A group of Usuls surround her, cooing patronizingly, adoration in their eyes, and for a moment, she allows herself to forget. "How old are you?" one of them asks her, bending down to tie a ribbon around her neck. She doesn't reply, just bats her eyelashes; the girl melts instantly and reaches to hug her. "You're so precious!" It lasts for a little while, then a voice pushes itself into the throng. "Rosie? Mina? Sally?" "Coming, Mom!" they call, and she is left alone somewhere by the Rainbow Pool, watching as they become nothing but tiny shadows in the distance, chattering excitedly to an older, smiling Usul. "Well, that's gotta be a record," she says to her reflection later that night, half-smirk on her face, twirling a ribbon around her finger. She's bigger now, with green scaly skin and squinty yellow eyes. "Shortest change ever. By Sloth, you are pathetic sometimes." The ribbon falls to the floor. She steps on it on her way out. She's not sure when exactly it started, when she began this whirlwind of a lifestyle. Maybe one morning she just woke up and decided she wanted something new. Maybe one day she drank a morphing potion, didn't recognize herself in the mirror – and liked it. So she did it again. And again. It dragged her in and consumed her, and now she doesn't go a week without changing her face. It's intoxicating, it's thrilling – and expensive. Oh, well. Nothing in life ever comes easy. And that's the way she likes it. At the moment, she's an innocent Faerie Yurble strolling through some poor sucker's shop, pretending to ooh and ahh over shelves laden with pretty potions. The owner isn't even looking at her anyway; she's far more concerned with a shady-looking Lutari in the corner. She smiles to herself – appearances don't mean a thing in this world, lady – and takes a flask off the shelf. 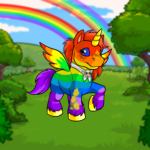 Rainbow Wocky Morphing Potion. Hmm. That's a new one. The owner still isn't looking at her, so she takes a Silver Peophin one, too. Don't get too greedy, now, she tells herself, but can't resist slipping one more bottle – Plushie Flotsam – into her bag before she leaves. Alarms blare as she walks through the exit, and the shopkeeper snaps to attention, staring straight at her, but she's chosen this look for a reason. Already she's soaring through the air, until the marketplace is just another dot in the distance behind her. The bottles clink in her bag; they carry all the weight of her world. The first time she tries Faerie, she sits on her bed watching the potion all night. Dark purple liquid bubbles gently from behind the glass, wreathed with feathers – lush green, luxurious purple – glittering darkly in the lamp light. Anticipation building in her throat, she pops out the cork, pressing the bottle to her lips – it's cold – and tilting her head back. Warm liquid trickles down her throat, tickling slightly; it tastes of nothing at all. The change takes a few moments to set in, and when it does, she closes her eyes. Bones shift, and skin shoots to feathers; there's something liquid-like about the whole transformation, rippling gracefully and flowing smoothly. When she opens her eyes again, she's taller, with an elongated neck and rich sapphire feathers and a long mauve beak. The world doesn't look any different. She drops the bottle and glides out the door, feeling weightless. Above, the moon beckons; she shivers, spreads her wings. Higher, higher; the air around her gets colder with every flap of her wings, but she presses on. A few minutes later, however, her feathers are beginning to ache – is that even possible? – and when she looks up, the moon, impossibly, seems even further away than before. She stops flying, and starts falling instead, tumbling through sky and clouds, just to feel something, anything at all, but when she lands in a heap on the grass and stares up at the stars, all she feels is cheated. She doesn't fly again, except for hasty getaways. The moon shines on in shame. She's walking down a busy street as a Speckled Lupe, no real destination in mind, when she bumps into somebody else. She mutters an apology, looks up – and falters. "Sorry," the Electric Cybunny says, "I wasn't looking where I was going." She smiles politely, but it fades. "Are you okay?" "I," she stammers, and for a moment her world spins. What is going on? The Cybunny stares at her strangely as she tries to find a reason for her shock. "You sure you're okay? You look kinda pale..." The Cybunny frowns for a moment, squints at her. "Do... Do I know you?" Her throat is dry, and in her mind, millions of faces flash by. Maraquan Meerca, Gold Shoyru, Purple Ogrin. 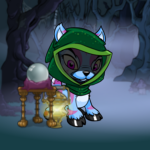 Pink Uni, Royal Gelert, Tyrannian Kacheek. Split Grundo, White Ruki, Halloween Mynci. Faint memories whisper in her ear, but they don't stir anything at all. She wonders if those faces belonged to people she once knew before, or stole from – or if they all belonged to her. "I... I don't know," she finally says. The Cybunny stares. She flees. She wakes up to a shining sun and singing birds, but takes one look at them and wishes she could shoot them right out of the sky. Her fur is all colours of the rainbow but she feels anything but vibrant, today. She feels cold. She feels angry. She feels... ugly. "That's right," she whispers to herself, and smirks. Three long strides later, she's standing at her cabinet, staring down the pile of potions before her. Pretty colours glow and gleam, stardust beckons invitingly, but she pushes them all out of the way. There, in the shadows – just what she needs. The bottle is hot in her hands, and when she uncorks it, steam crawls from the glass, slipping over her skin; for a moment, the smoke swirls and she sees a sneering face, but it dissipates and she's sure she just imagined it. It tastes putrid – she expected nothing less – but she guzzles it down, and when she's done she wipes her mouth, gray-green gristle dripping from her lips. She feels the ugliness inside her recoil, writhing in her stomach – and then she starts to change. Orange, yellow, green, blue, violet – they wither and fade to a pasty red. Fur scabs over, forming a scaly tapestry of oozing boils. Her flesh bubbles, then sags, drooping down into layers of fat; her shoulders crack and hunch over, making way for flaky, peeling wings. Horns rip out of her skin, sprouting all up her back; yellowed claws form and dig into her floor. Vile, she thinks. Disgusting. Grotesque, repulsive, nauseating. At last. A face only a mother could love. Then she pushes that thought away, because she hasn't thought about her mother in a long while, can't remember who she is, where she might be. She raises her head and grins at her reflection, sharp-toothed and slimy, because she loves seeing that monster in the mirror. Something has changed. Her mind feels weightless all the time – not like flying, but as though hovering on the edge of existence, as though it might float up and away into a pure new world. But when she opens her eyes, all she sees is her own reflection, everywhere, and it never seems right. She's going through potions much quicker than before, but with every new swallow, every transformation, her mind only gets lighter, and suddenly she's having trouble remembering what she ate for breakfast the day before, what colour and species she was last Monday, and just why does that Blue Scorchio living down the street look so familiar? He stops to say hello whenever they pass each other on the street, but she doesn't remember anything about him at all, and all she can do is stare back at him. After a while he stops saying hello, but then again maybe that's just because she's taken on a new face. One day she's standing in the mirror, trying out a new colour – it's too new to be easy to steal; the annoyingly clingy shopkeeper was proof of that. She twists about, studying every inch of her new Transparent Wocky body. Her bones are normal, nondescript; she can't see her brain through her skull and wonders fleetingly if her mind is still there. She stares at her beating heart and wonders if it's the same one she started out with, or if it changes with every new transformation. What did I start out as? The question catches her off guard, and she muses at her reflection, slightly uneasy. It's not weird that she can't remember, right? She's been through years of identities, after all. She tries to forget the thought, but suddenly it's all she can think about. It seems like the sort of thing someone should know. Well, it can't be too hard to find out, she thinks. She smiles at the mirror. It's positively skeletal. She's never tried Ghost before – there's something unappealing about floating around, being dead. She's not entirely sure why she swiped this one off the shelf, but there was something about that glow – it attracted her like a moth to a lamp. And not like that tacky Glowing colour – she tried it once, couldn't fall asleep with her own skin shining like some kind of gaudy green nightlight and had to use another potion. Should have taken Plushie instead. No, this glow is different – eerie, beautiful, haunting. But then again, what else do you expect from a Ghost morphing potion? She opens the bottle, peers warily inside; the liquid isn't even liquid, but more like fog, twisting and writhing shapelessly within the glass walls of its confinement. She throws her head back and tips it into her mouth, trying not to wince as it slithers down her throat, and swallows multiple times. A long moment passes, and she wonders if it worked, if she got it all down, if it somehow escaped and is floating around her room ceiling like a little lost soul. Then something shivers in her stomach, and she drops the bottle. She's floating now, hovering an inch or so above her bed. Her fur is colourless and glows dully, the same glow that attracted her at that potion shop, and she feels strange, so strange. She's not sure how to describe the feeling, but it weighs her down and makes it hard to breathe – is she even breathing? Is she dead? She blows out experimentally, breathes a sigh of relief at the puff of fog that escapes her lips. But then she swipes at her bed and stares in shock as her paw goes right through the mattress. She's a ghost. Of course. What else was she expecting? Stupid, stupid, stupid! Why didn't she take the Halloween Xweetok morphing potion instead? Panic leaps into her throat – will she stay like this forever? And under it all, threatening to suffocate, is that feeling she can't identify, and it's drowning her from the inside out. No, she tells herself. This is not how I'm going to end up, all dead and floaty in my bedroom. Gritting her teeth with determination, she stares hard at the floor in front of her mirror, concentrates – and glides smoothly to her destination. Well, that wasn't so hard. Looking up at her reflection, she sees that her eyes are red, blood red. And suddenly she realizes what she's feeling – sadness. Sorrow. It clutches at her heart and screams at her soul, and memories flash by in her mind – an empty teacup, a torn black dress, a boy on a bicycle playing outside the window. Only these memories aren't hers, she's sure of it. They're someone else's, and they carry all the grief of the living world – and the dead. She can't breathe, can't breathe, can't breathe – this is worse than being Grey; that sadness felt fake, cheap, like an advertisement. This is real, raw, and she can't handle it. She needs out. Now! Desperate, she floats to her cabinet, floats through the doors and grabs for a bottle, any bottle. But her flailing paws pass right through them, and she's terrified – she can't stay like this forever, she won't! So she closes her eyes and fuels determination again, squeezes so hard she thinks she might explode – and is rewarded with the cool touch of glass to her skin. She doesn't bother with the cork, just tips it to the ground and lets it shatter, dives down and licks hungrily at the liquid lining the floor. When all is said and done, she looks at her Red Koi self in the mirror and thinks about how everyone says you can't die, it's impossible. Maybe it is, she thinks, but now she knows that there are things a lot worse than death. It's an agonizingly slow process, but she refuses to give up. She spends a week at the local library digging through years' worth of Neopian Times issues. December 13th – Brown Kyrii waltzes off with five million NP worth of morphing potions. She looks at the grainy photo – they've only managed to get a shot of her tail as she escapes the store, but they've captured a lovely shot of the shopkeeper's ballistic face. She feels proud, then less so when she realizes she can't remember the incident. November 28th – Sketch Chia steals priceless Zombie morphing potion, among others; owner is devastated. Sketch? Was she Sketch once? She never even realized. October 19th – Christmas Flotsam steals from Kauvara herself. Well, she's got quite an illustrious career. If she closes her eyes and thinks hard, she can faintly remember kind blue eyes and a shop that smelled of stardust, and she feels a little guilty. But only a little. September 7th – Woodland Acara nabs five potions from shop; police are baffled. August 20th – four expensive morphing potions missing from mall; cops suspect Yellow Chomby. And so it goes, until months back become years as she traces backwards the web of her own crooked path. Spotted Kougra. I was a Spotted Kougra, once. Maraquan Ixi – how on earth did I ever get around with fins? Shadow Shoyru – but of course, I think I remember that. I was feeling dark. Snow Techo. Island Hissi. Desert Aisha. Darigan Bori. The memories are slowly slipping and sliding into place, interlocking somewhere deep within her mind. She shuffles through layers and layers of dusty, dry paper, until – June 12th – she stops with her finger on the date, on a headline proclaiming thief runs away with a morphing potion – she's here. It's the first one. She knows, because she suddenly remembers that first time – heart strung out with nerves, shifty glances, running like her life depended on it. It's the only time ever that she only took just one. Blue Kacheek, she remembers – she started off small. The only thing she doesn't remember is what species, what colour she was at the time of the theft. What she started out as. All she has to do is open up the issue to the article, and she'll see a photo. She'll see herself. She'll know. She looks up. The librarian peers concernedly at her from over her spectacles. "We're closing soon, miss. I'm sorry, but I have to ask you to leave." "Right," she says, flustered, shoving the newspapers back into their box. "I'm sorry," she says, and the librarian looks confused, maybe starts to ask why, but she's already gone. The newspaper is safely hidden, nestled in her Cloud Pteri feathers. She's always been a master at her art. Maybe that's all she's ever been. She sleeps and dreams of things she's never thought before. "Come home soon, honey," her mother says; her face is shadowed by the sun, but she can still make out her smile. She shifts uncomfortably in a white lace dress; beside her, someone laughs and says something, but it's muffled in her ears. She punches them affectionately on the shoulder, "Shut up, Annie." Ivory keys plink beneath her fingers. She's playing a folk song, something old, something about love letters and crows in cornfields; behind her, someone claps. A firefly flickers, goes out. "Where have you been?" Anger trembles in his voice. "We were so worried about you. God, we were all so worried about you,"
She keeps her eyes on the floor and stumbles out of bed, reaches for the first one she sees, three gulps later and she's somebody else. "Good as new," she says aloud, and tries to pretend her voice doesn't crack as she does. In the end, she's Fire and it's fitting, and she watches the newspaper blacken on the end of her tail. Ashes, ashes, she thinks, watching them burn into the floor, and she wishes she were braver to do anything else. She feels a little like she did when she was Ghost, briefly. She feels like a sour apology or a silent goodbye. Goodbye. Goodbye. It happens slowly, at first. She glances in the mirror and realizes there's something odd, something off about her reflection. She can't quite put her finger on it – and then she sees her ears. Or rather, the place where they should be, because she hasn't got any. She stares, transfixed, as her fiery form in the mirror begins to fade. The intricate gold swirls are being bled from her skin, distorting and blackening like cold, curling ashes. Her feet and fur are the next to go, and her tail dies abruptly, the remains of the newspaper scattering to the floor. She watches her face vanish slowly, and as she does, all the other masks she's ever worn flash by in her mind – brown nose black scales blue fur jagged teeth orange beak blue eyes black eyes green eyes – green eyes – there was something about green eyes – her eyes are gone. There's nothing left in the mirror but her fiery mane, fingers of flame wildly dancing in the dark, and she watches it in amazement, because she never knew her soul could burn that bright. And then it's gone too. She looks in the mirror and sees nothing but ashes. It's very rare, she's heard people say; it's not called a random event for nothing. To be honest, she's surprised she's never tried this colour before – in hindsight, it only seems obvious. Forget Mutant, forget Shadow, even Ghost; in the end, Invisible has always suited her best – and it's the only change she didn't do herself. Maybe this is the world trying to tell her something. And maybe not, maybe it's just sheer dumb luck, but whether it's good or bad, she can't quite tell yet. Maybe she'll stick with it, for a very long time. Experimentally, she thinks hard, closes her eyes and concentrates, but she can't remember a thing. Already things are starting to fade. Was something burning, before? She can smell something burning. She dimly remembers something about fireflies, but it disappears, and so does she. There's a room in a house on a street where nobody's lived for years, and in that room you'll find nothing but a broken mirror. But if you look carefully, stardust still seeps through the cracks of the long-ago locked cabinet. And no, that isn't just dirt on the floor. Outside, the moon still shines with shame.